After several tireless days we have finished crunching the numbers from the more than 700 13F filings issued by the elite hedge funds and other investment firms that we track at Insider Monkey, which disclosed those firms’ equity portfolios as of September 30. The results of that effort will be put on display in this article, as we share valuable insight into the smart money sentiment towards Legg Mason, Inc. (NYSE:LM). Is Legg Mason, Inc. (NYSE:LM) the right pick for your portfolio? Prominent investors are becoming hopeful. The number of bullish hedge fund bets inched up by 3 lately, and the company was in 20 hedge funds’ portfolios at the end of September. In spite of this recent enthusiasm, the number of smart money investors with long holdings of the stock wasn’t enough for it to be included in 30 most popular stocks among hedge funds in Q3 of 2018. Nevertheless,t the company still deserves are attention, and we are going to examine it further in the article. 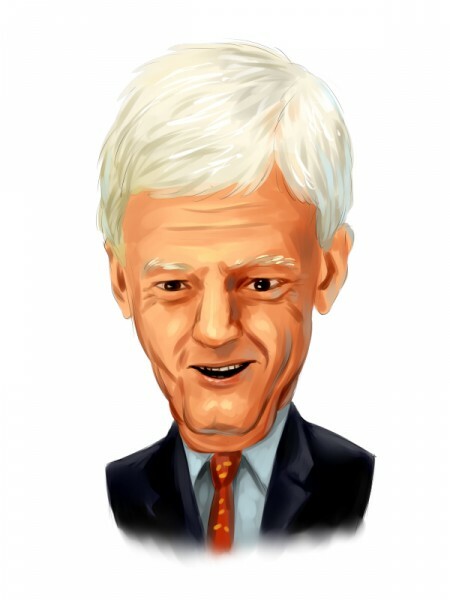 Let’s take a look at the new hedge fund action encompassing Legg Mason, Inc. (NYSE:LM). At Q3’s end, a total of 20 of the hedge funds tracked by Insider Monkey held long positions in this stock, a change of 18% from the previous quarter. 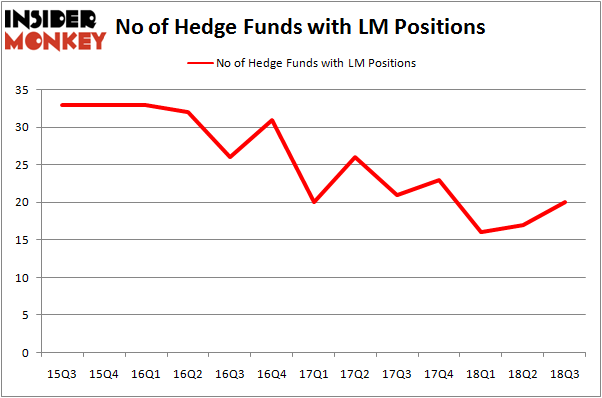 On the other hand, there were a total of 23 hedge funds with a bullish position in LM at the beginning of this year. So, let’s see which hedge funds were among the top holders of the stock and which hedge funds were making big moves. More specifically, GAMCO Investors was the largest shareholder of Legg Mason, Inc. (NYSE:LM), with a stake worth $63.9 million reported as of the end of September. Trailing GAMCO Investors was Pzena Investment Management, which amassed a stake valued at $20 million. Balyasny Asset Management, Millennium Management, and Renaissance Technologies were also very fond of the stock, giving the stock large weights in their portfolios. As one would reasonably expect, some big names have been driving this bullishness. Renaissance Technologies, managed by Jim Simons, assembled the largest position in Legg Mason, Inc. (NYSE:LM). Renaissance Technologies had $11.9 million invested in the company at the end of the quarter. D. E. Shaw’s D E Shaw also initiated a $3.8 million position during the quarter. The other funds with new positions in the stock are Gavin Saitowitz and Cisco J. del Valle’s Springbok Capital, Brandon Haley’s Holocene Advisors, and Ian Simm’s Impax Asset Management. Let’s also examine hedge fund activity in other stocks – not necessarily in the same industry as Legg Mason, Inc. (NYSE:LM) but similarly valued. We will take a look at Washington Federal Inc. (NASDAQ:WAFD), Fox Factory Holding Corp (NASDAQ:FOXF), Medifast, Inc. (NYSE:MED), and Seritage Growth Properties (NYSE:SRG). This group of stocks’ market values are similar to LM’s market value. As you can see these stocks had an average of 15 hedge funds with bullish positions and the average amount invested in these stocks was $232 million. That figure was $156 million in LM’s case. Medifast, Inc. (NYSE:MED) is the most popular stock in this table. On the other hand Fox Factory Holding Corp (NASDAQ:FOXF) is the least popular one with only 10 bullish hedge fund positions. Legg Mason, Inc. (NYSE:LM) is not the most popular stock in this group but hedge fund interest is still above average. This is a slightly positive signal but we’d rather spend our time researching stocks that hedge funds are piling on. In this regard MED might be a better candidate to consider a long position. Is Forest City Realty Trust, Inc (NYSE:FCEA) A Good Stock To Buy? Hedge Funds Were 600% Overweight This Stock Right Before The Merger Announcement... Here is What Hedge Funds Think About Ocean Rig UDW Inc (NASDAQ:ORIG) Is California Resources Corp (NYSE:CRC) a Good Stock to Buy? Spirit Airlines Incorporated (NASDAQ:SAVE): Are Hedge Funds Right About This... Do Hedge Funds Love Tidewater Inc. (NYSE:TDW)?